Catherine Ince is Curator at Barbican Art Gallery, where she specializes in twentieth-century and contemporary architecture and design. Eames Demetrios is the director of the Eames Office and chairman of the Eames Foundation.. Patricia Kirkham is a professor at Bard Graduate Center for Studies in the Decorative Arts, Design and Culture. Dr. Eric Schuldenfrei is the author of The Films of Charles and Ray Eames.Anthony Acciavatti is principal at the architectural firm Somatic- Collaborative, NY. Sam Jacob is Professor of Architecture at the University of Illinois, Chicago and Visiting Professor at the Yale School of Architecture. Alison Moloney is Curator and Research Fellow at the London College of Fashion. "Among the most beloved designers of the American Midcentury movement, the Eames were also prolific artists in multimedia. See it all in this collection." "The humble Eames chair—with its fiberglass seat perched on a four-legged metal base—might just be the poster child for midcentury-modern furniture, its balance of form and function perfectly summing up the popular design theory of the era. Now a new book provides an inside look at the life of its creators, Charles and Ray Eames. . . The World of Charles and Ray Eames showcases the design duo through the decades with photographs of their graphic, forward-looking home as well as their endlessly innovative office. Pictures of their creations—the famous Eames lounge chair, an abundance of toys for children, a molded plywood splint developed for the U.S. Navy—join a selection of reprinted texts, archival images, and hand-scrawled letters and pages ripped straight from the notepads of the designers themselves." "Charles and Ray truly embodied Californian modernism. You cannot help but smile at image after image of this handsome and healthy couple working alongside other equally sunny faced artists and designers in their Eames Office. Here they collectively experimented with new material, finding new solutions for sustainable products, creating movies, stills and architectural models for living. Their energy is intoxicating, almost bouncing off the pages of this book." 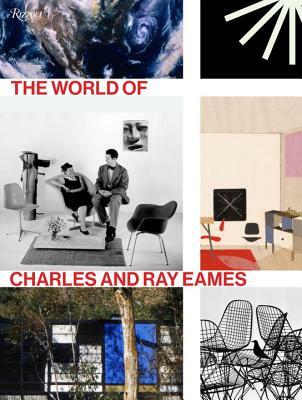 "At long last - the first comprehensive book in over a decade on the legacy of two of the most important 20th century designers, Charles and Ray Eames."